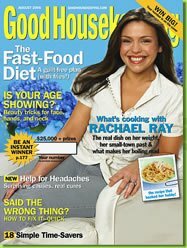 Good Housekeeping recently did a six-page feature on Rachael Ray, two small parts of which are on the Good Housekeeping website. I have to admit that I hate the picture of Rachael on the cover. It doesn't look bad in the little picture at left, but on the cover she looks like a mannequin. Is that the best they could do? But, setting the cover aside, the main thing I got from the article was Rachael's self-awareness. She said that when the Food Network came to her in 2001 after seeing her on NBC's Today show, she warned them: "I'm beer out of the bottle and you're Champagne. I'm not a chef, I won't wear a chef's coat. I don't know the right way to chop an onion. You shouldn't be giving me this job." That attitude is exactly what has made her as popular as she is - her style is not intimidating. She makes cooking fun and casual, not high maintenance. Rachael and the interviewer arranged to meet at the W Hotel restaurant, but it turns out it was closed. They opened it so the interviewer and Rachael could meet, but when Rachael arrived and approached the bar to get a glass of water and offered to take it to the table herself, the bartender told her they were closed. She told the interviewer "We. Are. Leaving." But only after she told the concierge that she was displeased. Rachael does not watch any of her shows, in part because she does not want to know how she looks because she doesn't "want to get wrapped up in all that nonsense." She also said that her "TV voice upsets the dog." How funny! Her husband, John Cusimano, is also barred from watching, but says he sneaks in some viewing when he gets the chance. John is a lawyer and also handles Rachael's legal matters. Rachael also said: "I have been underqualified for every job I've ever had . . . ."
If you would like to learn a little more about who Rachael is and how she sees the world, I highly recommend picking up this issue of Good Housekeeping. Or, go to a bookstore, stand in the aisle and read it there! Admittedly, it is not a magazine I usually read, but it was well worth the cover price for such an in-depth and interesting article.